Whatever time of year you choose for your wedding, you can never completely rely on the weather to behave! Be prepared and be beautiful on your special day. 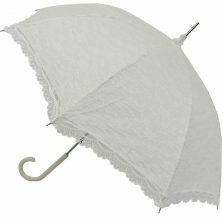 Looking for a white lace umbrella? Designed for the Bride who is after that traditional look on her special day. 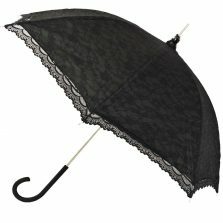 You’ll have go a long way to better our new Victorian wedding parasol / white lace umbrella. Even a brief shower at the wrong moment could spoil months of planning. Our Victorian wedding umbrellas are feminine with subtle yet elegant undertones of a bygone age. Those Victorians really knew a thing or two about combining weddings with style and elegance! Totally waterproof, this beautiful Victorian style wedding parasol / white lace umbrella can be used as a parasol if the sun is shining. As well as a wedding umbrella in the event of an imminent downpour. Allowing you to plan for both eventualities! 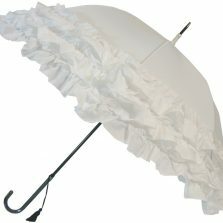 These exquisite and dainty wedding umbrellas are available in White, Black and Ivory and are 78 cm in length with a canopy span of approximately 90 cm. Weight 280 g approx. That’s a nice size to carry, offering you the protection you need without being too cumbersome. Our Victorian wedding umbrellas have a double canopy. The inner lining of this white lace umbrella provides both protection from the rain and shade from the sun whilst the outer canopy with its intricate design, finished off with a delicate lace trim, provides the beautiful effect and great looks you want on your special day. 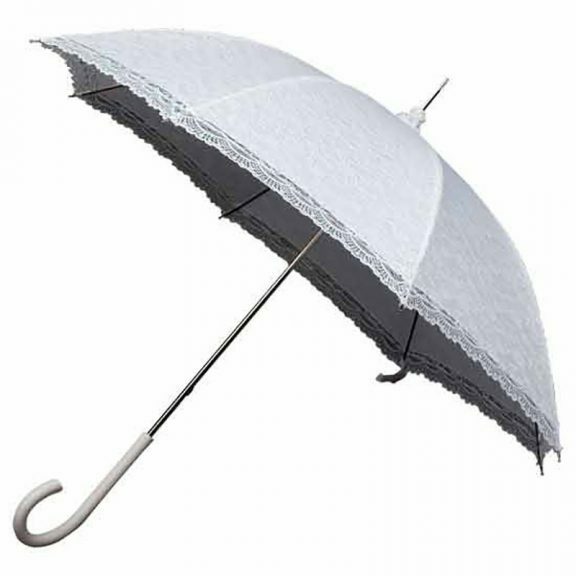 In keeping with the traditional theme this Victorian wedding parasol / white lace umbrella has a manual opening mechanism and colour coordinated crooked handle. So, the bride can carry it over her arm, a great effect when it’s time for the photographs! Not the umbrella for you? 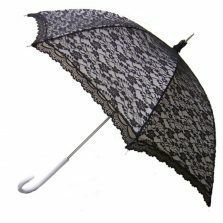 Check out the rest of our range of quality Fashion Umbrellas!